Stoner by John Williams is possibly my favourite book of 2015. It's the story of William Stoner, who is born into a poor farming family with little means. Touchingly, his father suggests that he attend University to study agriculture in the lead up to taking over the family farm. Whilst at University, Stoner unexpectedly falls in love with literature and decides to put his agricultural studies - and the family farm - aside to become an academic. His relationship with his uneducated parents suffers as a result of this choice and his once close bond with them begins to fade. We follow Stoner as he commences what will be a quiet and underwhelming career as a university academic, although his rivalry with a colleague gives way to some of the funnier parts of the novel. His marriage is a failure and his relationship with his daughter is painful, and throughout the novel I longed for Stoner to shout or put his foot down and make a stand to improve his home life. This is a deeply honest portrait of an average man, living an average and sometimes depressing life, but it's told with such care and beauty that I really was swept away. I finished reading Stoner a few weeks ago and the final paragraph still makes my chest ache with sadness (similar to the ending of Cloudstreet, the one difference being I didn't cry this time, but it was close). 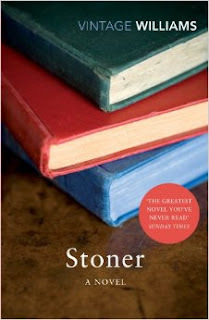 * I received this novel from Random House last year, as part of their National Book Bloggers Forum (NBBF14) and if it wasn't for this, I don't know if I'd ever have discovered Stoner on my own. I've had this on my TBR list for a couple of years. You've just encouraged me to move it closer (much closer) to the top! Oh my god. I must have it as well and have no idea how I've overlooked it! Thanks so much for sharing Tracey! You're most welcome Deb. You probably picked it up the same way I did (in a certain goodies bag), but oh my gosh, I absolutely loved it! !